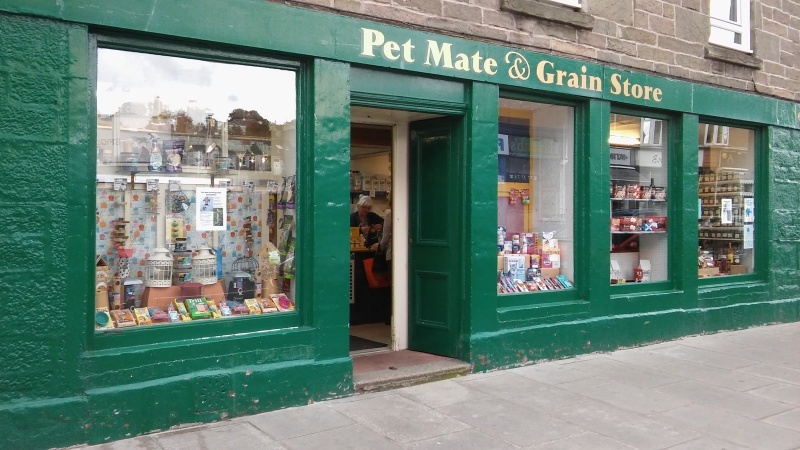 Pet Mate provides a huge range of pet foods and pet accessories. We have wild bird foods and a variety of feeders. In fact we stock or can source anything you may require to keep your animal friends happy. The Grain Store provides a wide variety of oatmeal, flour, pulses, dried fruits, beans, herbs and spices. We also stock a large range of oat cakes, biscuits, jams, chutneys, cordials and traditional sweets. Dog and cat beds, dog coats, leads and harnasses. Dog and cat toys. Pet treatments and grooming products. Bird cages, perches and toys. Wild bird feeders. Small animal cages/hutches, bedding products and gnaws. Aquarium accessories. 6 different grades of oats. 8 varieties of flour for bread and cake making. Granulated, caster, dark/light brown and demerara sugar. Nuts and dried fruits. Pulses and dried vegetables. Long and short grain rice/basmati rice. Coffee Beans, whole or freshly ground in store. Preserves, chutneys and curds.